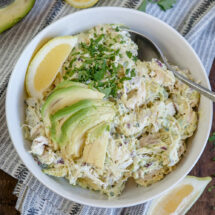 Avocado Chicken Salad is as delicious as it is good for you! With creamy avocado, lemon juice and seasonings, it’s like your favorite guacamole meets your favorite picnic sandwich – and it’s amazing. Springtime is picnic time, and we love sandwiches for picnics even if they’re just in our own backyard. 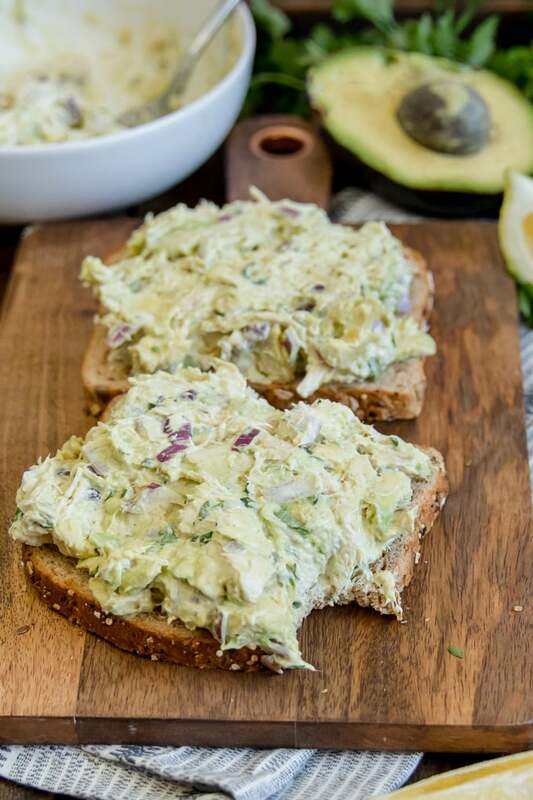 Serve this Avocado Chicken Salad on toasted whole grain bread with some sliced tomato for the ultimate, healthy lunchtime indulgence. Be sure to have some of our famous Classic Macaroni Salad and Fruit Salad to serve with it. Lunch time can be tricky. 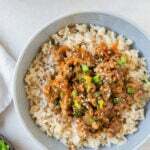 You want something healthy, simple and delicious that can fill you up without weighing you down because whether you’re running errands, working from home or in an office, you need good fuel to keep you going. Salads like this one are an excellent option because you can customize them to your own personal tastes, they’re healthy and also super easy to make. In my line of work I end up with a lot of leftover food. 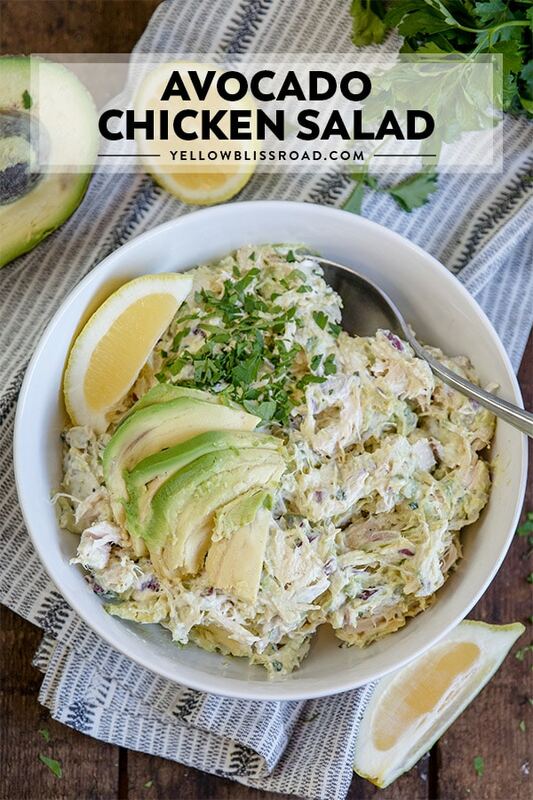 This Avocado Chicken Salad made it’s way to our next door neighbor’s house and I got a text the next day sharing how much she loved it and when would I be posting the recipe! Well, here you go my friend. I give you my incredible Avocado Chicken Salad recipe! Simple cold salads like this one can easily be made up to 24 hours in advance. Because of the mixture of ingredients the avocado won’t have a chance to turn brown, but in case it does you can just scrape that little bit off the top before eating. Start with some mayo, sour cream and lemon juice in a bowl. 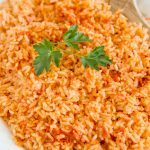 You can also use lime juice or a combination of the two depending on your preference. Stir together with diced onions, cilantro (or parsley if you’re not a cilantro fan) and garlic powder. 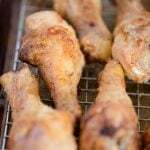 Stir some cooked and shredded chicken into the mayo mixture until it’s well combined. Slice an avocado in half and carefully remove the seed. Scoop out the flesh and place it into the bowl with the chicken mixture. 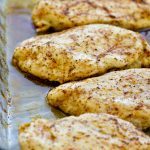 Squeeze a little lemon juice on the avocado to help keep it from turning brown and start mashing with a fork as you mix it into the chicken salad. Taste the avocado chicken salad and add salt and pepper to your liking. 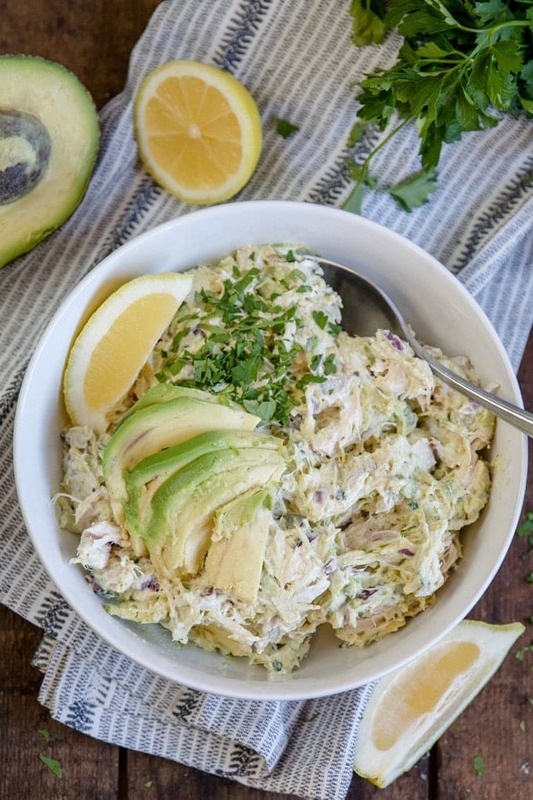 You can also customize the flavor of your avocado chicken salad by adding more or less of the lemon juice, cilantro or even toss in some diced tomato. 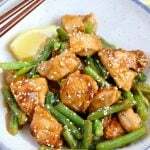 Store leftovers in the fridge in an airtight container for 2-3 days. Freezing is not recommended. What can I substitute the mayonnaise with? 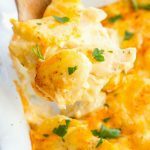 This recipe does call for a little bit of mayo and sour cream because I personally like the flavor and creaminess they add. However, if you would like to leave out them out, here are a few things you can swap in. Yes! Avocados are great! They are full of nutrients and healthy fats and have been shown to lower cholesterol, making them a healthy alternative to creamy spread like mayo. Avocado Toast is a huge trend right now and is as simple as mashing or slicing an avocado and placing on some whole grain bread with toppings like eggs or tomatoes. And basically, add some chicken to that and you’ve pretty much got everything you need to make my Avocado Chicken Salad! You want avocados that are nice and ripe, but not over ripe. In the store, give the avocados a little gentle squeeze in the palm of your hand (using your finger can bruise the flesh). You want the avocado to have some give to it, but still be slightly firm and not at all mushy. If all that is available are hard avocados, take those and place them in a paper bag for several days to speed up the ripening process. You can also determine the ripeness of an avocado by it’s stem. If the stem is easily removed and it green underneath, it’s ripe and ready to enjoy. If you want to be a true avocado aficionado, grab yourself an avocado slicer – this is my favorite kitchen gadget! It will slice the avocado open, remove the pit and slice the flesh, all in one cute little gadget. It’s totally worth the $10! Yes and no. Avocados freeze quite well but watery ingredients like tomatoes and onions, do not. The trick is to freeze just the avocado by itself. Slice avocados, then peel and seed them. Mash the avocados with a the juice from half of a lemon or lime, then place mashed chunks into a freezer bag and squeeze out as much air as possible. Freeze your guacamole starter for up to four months. If you want to freeze whole chunks of avocado, slice, seed and peel them. Brush each avocado half with lemon or lime juice, then wrap individually and tightly with plastic wrap. Place each half in a large ziploc bag and freeze for up to six months. 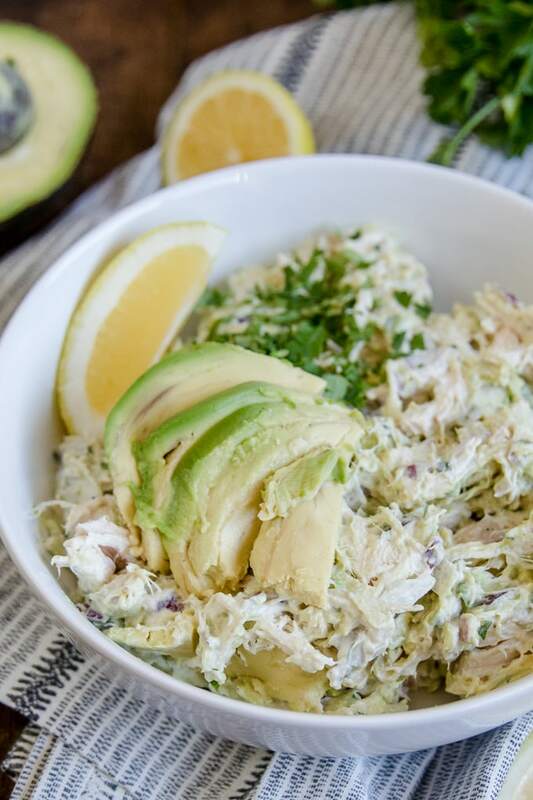 Follow these steps and you can make this Avocado Chicken Salad any time of the year! 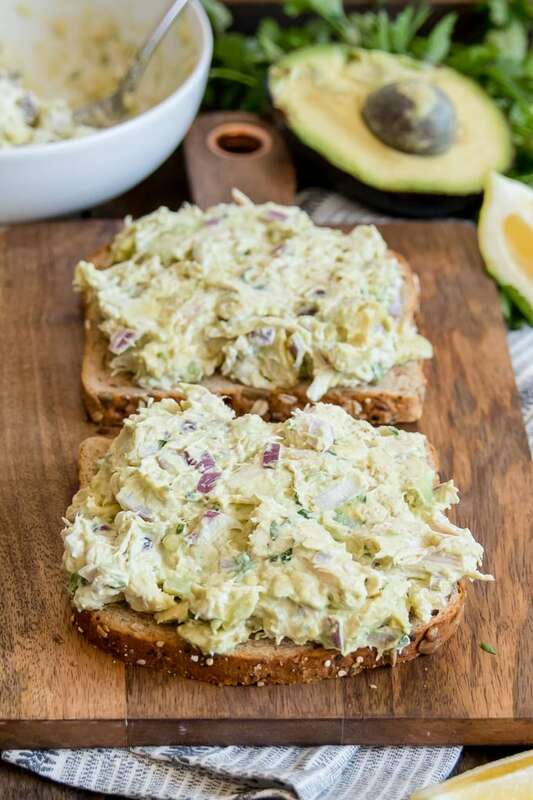 Avocado Chicken Salad is healthy and delicious - it's like your favorite guacamole meets your favorite picnic sandwich! 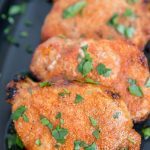 Perfect for lunch or dinner! 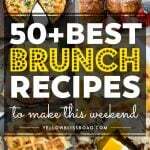 In a large bowl, combine mayonnaise, sour cream, lemon or lime juice, diced onions, cilantro and garlic powder until well mixed. Slice the avocado in half and remove the pit. Scoop out the avocado and add it to the bowl, then gently smash into chunks as you stir it into the chicken salad mixture. Season with salt and pepper to taste. Add more fresh lemon or lime juice as desire. Serve this Avocado Chicken Salad on toasted whole grain bread or croissants with added tomato slices to make sandwiches. It's also great on crackers or just on it's own.